We’d love your help. Let us know what’s wrong with this preview of The Staff of Fire and Bone by Mikko Azul. To ask other readers questions about The Staff of Fire and Bone, please sign up. Cédron Varkasa is an unwelcomed half-breed. While his father is the Regent, his mother is a powerful Shäeli demon. He will soon inherit abilities that frighten the people of Muralia. Cédron is desperate for acceptance and jealous of his half-brother's status as the favored warrior. He seeks his father's approval. When a natural disaster threatens his home, Cédron runs away. He must choose between the forces of good and evil and find the right place in his world. Excellent world building with diver Cédron Varkasa is an unwelcomed half-breed. While his father is the Regent, his mother is a powerful Shäeli demon. He will soon inherit abilities that frighten the people of Muralia. 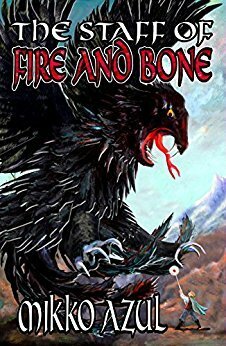 Excellent world building with diverse characters, The Staff of Fire and Bone is a thrilling fantasy. Filled with action, likable characters, and enough otherworldliness to satisfy young and old, the book will appeal anyone from 12 to 100. I received a review copy of the e-book from the publisher. The Staff of Fire and Bone is a thrilling tale of a misfit with a destiny to save the world of Muralia—and the power to destroy it. Cedron is the son and presumptive heir to the Regent of Dulnat, but he is hated for his mixed parentage in a world where the four peoples prize racial purity. It doesn't help that he has recently manifested uncanny and barely controlled magical power. When he is blamed for a disaster during a festival, Cedron I received a review copy of the e-book from the publisher. The Staff of Fire and Bone is a thrilling tale of a misfit with a destiny to save the world of Muralia—and the power to destroy it. Cedron is the son and presumptive heir to the Regent of Dulnat, but he is hated for his mixed parentage in a world where the four peoples prize racial purity. It doesn't help that he has recently manifested uncanny and barely controlled magical power. When he is blamed for a disaster during a festival, Cedron escapes the city pursued by enemies, but soon gains allies—and knowledge of his destiny to right an ancient wrong, a destiny that requires the very lack of racial purity for which he has always been hated. Cedron is an appealing hero. He wants to do the right thing, but he's young and doesn't understand his power. He can be a hothead and makes mistakes as he learns to use it without letting it use him for darker deeds. His quest for the sacred stones that will help him save the world involves narrow escapes, battles with enemies (and future allies), heartbreaking losses, and courageous sacrifice. But it's not all dire. There's plenty of the kind of comic business to be expected when adolescents have an adventure, as well as philosophical reflections on what power is for and what destiny really means. My one (admittedly minor) complaint is that characters are constantly noticing, realizing, and deciding things. I'd rather these verbs were reserved for occasions when a character at long last makes an important decision, or notices something crucial for the first time, or finally realizes a critical truth that has been overlooked till now. The rest of time, don't tell me he noticed; show me what he noticed; don't tell me he decided; show me the action. This is my own pet peeve, so it stood out in any otherwise well told, imaginative tale. There are so many books on my 2018 to-be-read list on Goodreads and I'm proud to say that all of those books are written by female authors. My goal is to read at least one book from that list a week and last week, I completed Mikko Azul's The Staff of Fire and Bone. I wanted to post my review immediately after completing it, but since today (January 30th) is the book's publishing birthday, I decided to wait and offer my review as a book birthday gift. Read the entire review here http://www.projgi There are so many books on my 2018 to-be-read list on Goodreads and I'm proud to say that all of those books are written by female authors. My goal is to read at least one book from that list a week and last week, I completed Mikko Azul's The Staff of Fire and Bone. I wanted to post my review immediately after completing it, but since today (January 30th) is the book's publishing birthday, I decided to wait and offer my review as a book birthday gift. First: this is not a standalone, as I thought when I first read it. Phew! Azul has crafted a beautiful, intricate world with various races, cultures, and a beautiful magic system and religion. This tale is exciting, bringing new twists and turns as the story unfolds. The characters have complex motivations, the action was thrilling, and the soft, tender, and at times devastating moments brought me to my knees. The narrative easily switches between characters, beginning plots in multiple parts of th First: this is not a standalone, as I thought when I first read it. Phew! The narrative easily switches between characters, beginning plots in multiple parts of this world until they merge together beautifully. Muralia is a place of mystery and wonder but the people who once untied to defeat the great evil threatening the world have become divided, fractured into different races until they are virtual cut off from one another. Enter Cedron, the mixed-race heir apparent to the Regent of Dulnat. Considered by some to be a demon because of his mother, Cedron's blossoming magical powers only serve to fan the flames of fear towards him. Meanwhile, his half-brother, beloved of the people, may or may not be a Muralia is a place of mystery and wonder but the people who once untied to defeat the great evil threatening the world have become divided, fractured into different races until they are virtual cut off from one another. Enter Cedron, the mixed-race heir apparent to the Regent of Dulnat. Considered by some to be a demon because of his mother, Cedron's blossoming magical powers only serve to fan the flames of fear towards him. Meanwhile, his half-brother, beloved of the people, may or may not be angling to replace Cedron as regent-in-waiting - which is fine with Cedron. All he wants is to attend the Academy and learn to control his wild and powerful abilities. When Raesha, a girl from another race arrives bearing a dire prophecy and Cedron's black sheep of the family uncle turns up with an invitation to the Academy, Cedron must choose which to align with. He is thrust onto a much bigger stage. His quest is not just about finding his own place in a world where he'll never fit in comfortably, but also about facing an evil long assumed vanquished as he tries to unit peoples more interested in fighting each other than standing together to save the world. Mikko Azul is the award-winning author of Askari and The Staff of Fire and Bone. An avid fan of both Clive Cussler and Terry Brooks, Azul mixes fast-paced action and epic high fantasy to brilliant effect.